Do you talk about AIDS on the first date? Man resting with chin on hand. Dialogue about talking about AIDS. Yellowing. A lot of people don’t like to talk about AIDS. Phillip: Yeah, I think that’s pretty strange. Phillip: Nobody talks about it. But everybody’s afraid of getting it. Phillip: Of AIDS– yes. Of talking about it–no. So, how do you start the discussion? What sort of reaction do you get? Phillip: It certainly gets their attention." Order number: P072. CDC National AIDS Clearinghouse, Catalog of HIV and AIDS education and prevention materials September 1994, p. 26. 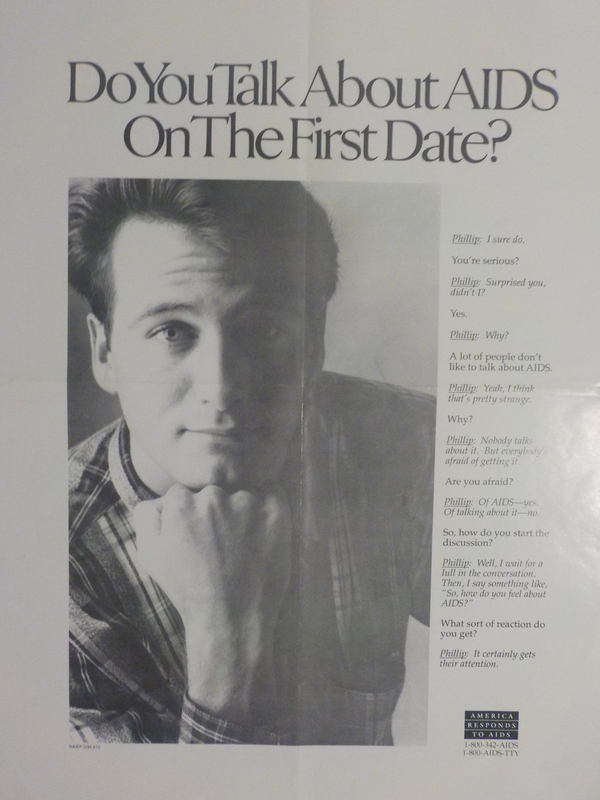 This poster presents questions and answeres about AIDS and dating.